Coming Soon: Audiobook for The Haunting of Cabin Green! I'm thrilled to announce that Tantor Audio and the talented Matt Godfrey joined up to create an audiobook of my award-winning, #1 Amazon bestselling modern Gothic horror book, The Haunting of Cabin Green! You can hear a sample of the audio over on Tantor's website. More information will be available as the official release date … Continue reading Coming Soon: Audiobook for The Haunting of Cabin Green! Gothic Horror Kindle Sale: 99 Cents! Kindle copies of The Haunting of Cabin Green are on sale in the US and UK for only 99 cents today! Be sure to grab your copy of the Gothic horror novel that PopSugar, Inquisitr, Ranker, and BoredPanda called one of the 'Best Horror Books of 2018.' Are you ready to meet The Darkness at … Continue reading Gothic Horror Kindle Sale: 99 Cents! Reader’s Choice Award Nominee: Please Vote! The Haunting of Cabin Green is a Reader's Choice Award Nominee for Best Horror/Suspense Book of 2018. Please vote by clicking here! 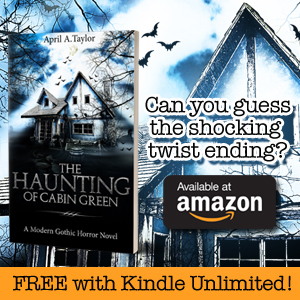 Comments count as votes, so please leave a comment that says "The Haunting of Cabin Green by April A. Taylor." The site is also giving away a free Kindle and Amazon gift card, if … Continue reading Reader’s Choice Award Nominee: Please Vote! Reviews Needed: Your Opinion is Very Important to Me! The Haunting of Cabin Green has been out for almost three weeks now (where did the time go?). The response in terms of sales and Kindle Unlimited page reads has been astronomical, and I'm so grateful to all of you! Now, it's time to show everyone else what you think about the book. 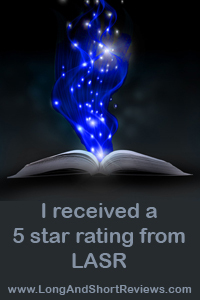 If you … Continue reading Reviews Needed: Your Opinion is Very Important to Me!